How do I fix the delay on my Razer Naga's buttons? I'm not sure if this is the correct site to post it on, but I'm having problems with my Razer Naga Epic. I took a break for about a week, and when I went to use my Naga Epic all the buttons, left click, right click, side buttons, everything are delayed by about 5-10 seconds. I can move the mouse pointer around fine, there's no delay there, but the buttons take 5-10 seconds to register. I've tried it on multiple computers and operating system, nothing different. I've tried taking the battery out, wired, wireless and nothing has fixed it, there's nothing on the Razer site about it and I've found nothing on Google. 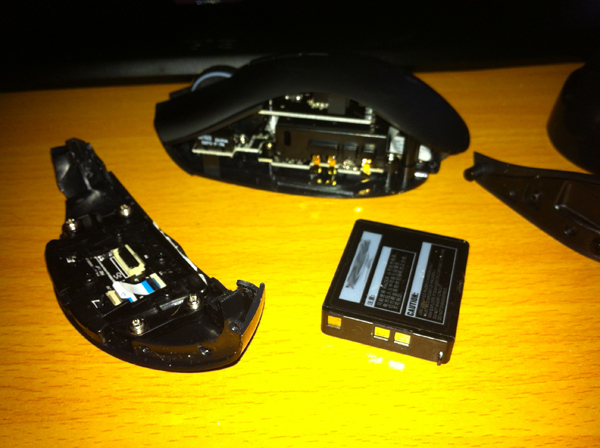 I've even tried throwing the piece of crap against the wall and still nothing, and yes I really did throw it against the wall, however it hit a music CD case and broke it, the mouse if fine other than the buttons still being delayed by 5-10 seconds. I am being 100% serious about this problem, does anyone have any suggestions? Edit: I have no problems with other mice, wired or wireless. The reason that the mouse does this is because it enters sleep mode when it stops moving, it seems that in your case the timer is affected which makes it enter sleep mode way too fast. For the device to return from sleep mode it has to reconnect Bluetooth, which can indeed take 5-10 seconds. Never mind, I finally had enough of the mouse and ended up throwing it against the wall hard enough to break it into pieces. This seems to do the trick, at least for the time being. Not the answer you're looking for? Browse other questions tagged peripherals razer-mouse or ask your own question. How to change the color of Razer Mamba? razer naga, how to assign Win key as a modifier? Any Ideas Why My Razer Naga LMB Interrupting Itself When Held Down?